A cottage style garden for a beautiful flint and brick sussex house. The owners of this beautiful house approached me to help with updating their garden. 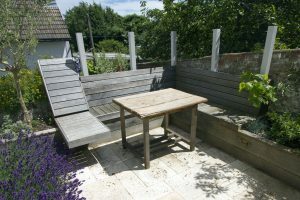 The brief was to create another area for relaxing, better access to the garden and cottage style planting at its best in the summer. They hoped to re use some as much of their patio material as possible. A built in sofa style seat angled towards the swimming pool and surrounded by plants gave the relaxed seating the garden needed. The old patio was lifted and relayed in a beautiful herringbone style with reclaimed brick edging. A generous path lead from the house to the 2 patio areas. The path was softened with pockets of thyme and lined with a zig zag of box hedging that contrasts with the softer cottage style planting. Purples, pinks and white planting pallet compliments the beautiful house.